Weow! I love how you did this. With a marker? I'm really into the texture. Thanks Jordyn! Tis is just done with ye olde dry brush, but I also incorporated a little bit of splatter and fingerprints in the last two panels. gosh, we squealed outside the post office when we got the package! thanks so much for your quacker kindness. franklin is over the moon! Any chance of doing more Hawkline Work? 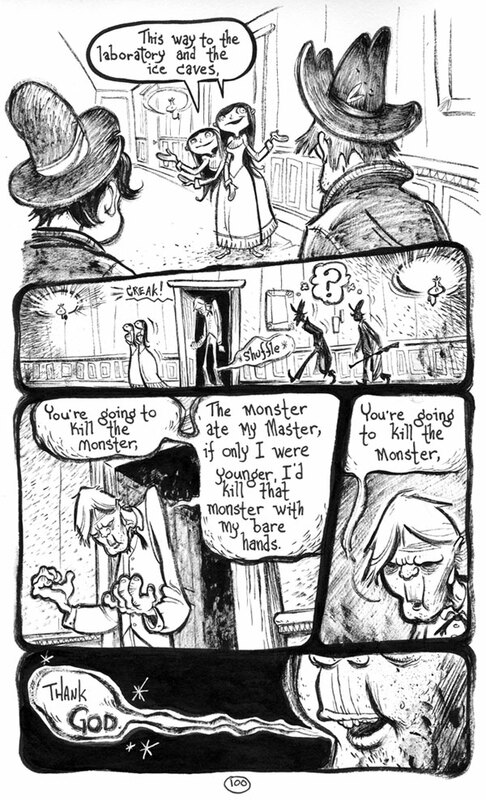 The Hawkline Monster is my favorite book in the world. Brautigan is my favorite writer. Just looking at your page 100 sketch, I'm sitting here salivating over the thought of a full graphic novel version of the story. Any chance you'd ever consider doing more page illustrations from the book? I think you really captured the look and feel of the novel in your page 100 illustration, and I would just love to see you go farther with it.